Group G of the 2010 FIFA World Cup began on 15 June and ended on 25 June 2010. The group consisted of reigning Copa América champions Brazil, North Korea, Ivory Coast and Portugal. Brazil and Portugal were also drawn in the same group at the 1966 FIFA World Cup, their previous official World Cup match. In 1966, the Portuguese team defeated Brazil 3–1, thus eliminating the defending champions, to advance to the quarter-finals where they encountered and defeated North Korea (another team in Group G) 5–3, after trailing 0–3. As winners of the group, Brazil advanced to play against Chile – runners-up in Group H – in the Round of 16, while Portugal – the Group G runners-up – met Spain, who won Group H. Ivory Coast finished third in the group, and North Korea finished bottom. 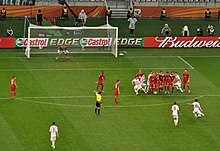 The North Koreans had a goal difference of −11, the worst of any team in the 2010 tournament, largely due to the 7–0 defeat they suffered against Portugal; that match was Portugal's biggest ever World Cup win, and North Korea's heaviest ever defeat. It was also the first time a live football game was broadcast on North Korean television. Brazil advanced to play Chile (runner-up of Group H) in the round of 16. Portugal advanced to play Spain (winner of Group H) in the round of 16. ^ "Match Schedule 2010 FIFA World Cup South Africa" (PDF). fifa.com (Press release). FIFA. Retrieved 6 December 2009. ^ Watts, Jonathan; Hytner, David (21 June 2010). "North Korea broadcasts live match on TV for first time (pity they lost 7-0)". The Guardian. Retrieved 24 September 2010. ^ a b c d e f g h i j "Referee designations for matches 1-16" (PDF). FIFA.com. Fédération Internationale de Football Association. 5 June 2010. Archived (PDF) from the original on 5 July 2010. Retrieved 5 June 2010. ^ a b "Tactical Line-up – Group G – Cote d´Ivoire-Portugal" (PDF). FIFA.com. Fédération Internationale de Football Association. 15 June 2010. Archived (PDF) from the original on 2 July 2010. Retrieved 15 June 2010. ^ a b "Tactical Line-up – Group G – Brazil-Korea DPR" (PDF). FIFA.com. Fédération Internationale de Football Association. 15 June 2010. Retrieved 15 June 2010. ^ a b "Tactical Line-up – Group G – Brazil-Cote d´Ivoire" (PDF). FIFA.com. Fédération Internationale de Football Association. 20 June 2010. Archived (PDF) from the original on 2 July 2010. Retrieved 20 June 2010. ^ a b c "Tactical Line-up – Group G – Portugal-Brazil" (PDF). FIFA.com. Fédération Internationale de Football Association. 25 June 2010. Archived (PDF) from the original on 2 July 2010. Retrieved 25 June 2010. ^ "Tactical Line-up – Group G – Portugal-Korea DPR" (PDF). FIFA.com. Fédération Internationale de Football Association. 21 June 2010. Archived (PDF) from the original on 5 July 2010. Retrieved 21 June 2010. ^ a b "Tactical Line-up – Group G – Korea DPR-Cote d´Ivoire" (PDF). FIFA.com. Fédération Internationale de Football Association. 25 June 2010. Archived (PDF) from the original on 2 July 2010. Retrieved 25 June 2010.